133 Hazelton Residences - Only 5 Weeks Left! Home » Luxury Condos » 133 Hazelton Residences – Only 5 Weeks Left! 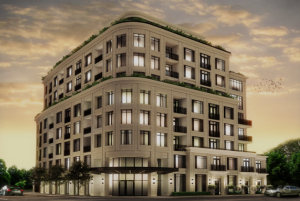 133 Hazelton Residences – Only 5 Weeks Left! This is your last chance to view the Presentation Gallery of 133 Hazeleton. In just five weeks, construction begins. You still have an opportunity to customize the suite of your choice, to meet your personal preference and style. Within one month of its grand opening, over half of the 38 residences were sold. There are still one, two, and three bedroom units available. Developer Mizrahi Khaili and Page & Steele Architects are about to build a 9 storey French neoclassical building featuring limestone exterior, soundproof walls and windows. The interior will be designed by the world renowned Gluckstein Design. It will consist of only 38 luxury suites (3 will be executive townhomes). Ceiling heights will be 10.5’ and suites will be pre-wired with CAT6 computer network. Pre-finished engineered hardwood flooring, architectural mouldings and baseboards, are standard throughout. Miele kitchen and laundry appliances are also included in the purchase price. The kitchen and bathrooms will feature Kholer fixtures. Larger suites with terraces will have double-sided gas fireplaces, which can be enjoyed from both the living/dining room and on the balcony. Each suite will have its own heat pump unit, with a humidifier and programmable thermostat. All units will include a minimum of one parking space and one locker. Amenities of 133 Hazelton will include a 24 hr concierge, valet parking, fully equipped fitness room, media/screening room, guest suites, and a party room (with lounge, formal dining room with catering kitchen, and a fireplace). 133 Hazelton has a proposed occupancy of December 2014. >>Click here to contact me, if you are interested in this project or any other condo or loft development in Toronto.